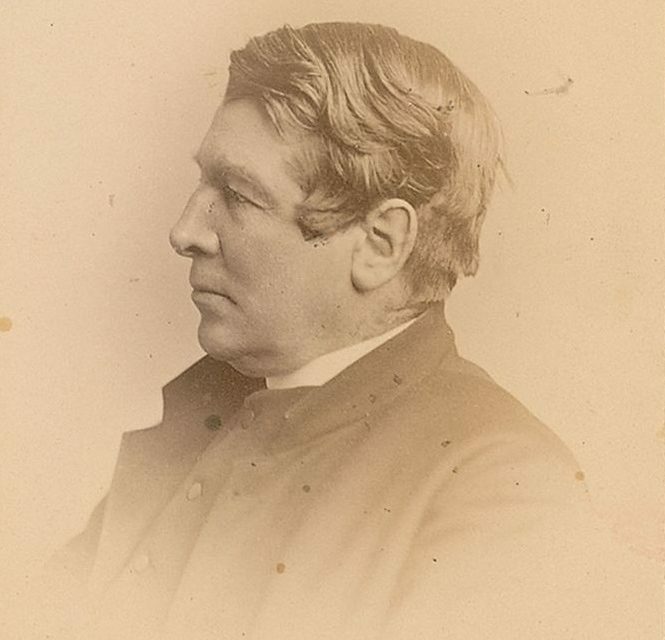 Samuel Reynolds Hole was an Anglican priest, author and horticulturalist in the late 19th century and the early part of the 20th. Hole was born in Newark and educated at Brasenose College, Oxford. He had a passion for roses a lasting friendship with the gardener Gertrude Jekyll, as well as with writers with Charles Dickens and William Thackery who also visited Limerick. In 1859 he journeyed around Ireland and published ” A little tour in Ireland” By an Oxonian. with illustrations by John Leech. published in London: Bradbury and Evans, 1859. Undoubtedly, there is solace for the forlorn in the pleasant city of Limerick. Justly celebrated for its Hooks, it is far more admired for its Eyes, for, although the former are the best in all the world, the latter are much more killing ! 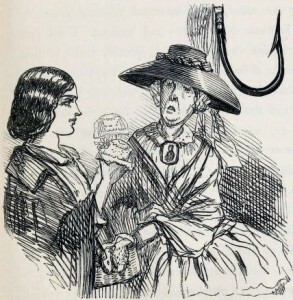 No sooner did we emerge from Mr. Cruise’s very excellent and extensive hotel, than we were attacked and surrounded by the lace-girls, in their blue cloaks, drooping gracefully, with heads uncovered, or rather most becomingly covered with thick and glossy hair. At first, we recklessly resolve to cut a way through with our umbrellas, or perish in the attempt, but the utter hopelessness of such a fearful step induced us finally to capitulate, the Siege of Limerick was raised, and commercial relations peacefully established between the besiegers and besieged. I did just venture to inquire what use I could possibly make of four superficial inches of fine linen, surrounded by very delicate openwork, not less than a foot in width, and was immediately answered, “And shure, yer honner’ll be for buying the handkerchief, to dry up the tares of the swate young lady, as is waping for ye over the says.” We would have it of course, and the “splendid pair o’slaves,” and a miscellaneous assortment, which created an immense sensation on our return home, and were declared to be both pretty and cheap; for “when maidens sue, men give like gods,” or geese, as the case may be; and such winning looks of tender entreaty came from under those long dark eye-lashes, that I really believe their owners could have persuaded us to purchase a complete collection of poisonous reptiles, or a copy of “Gems from Spurgeon.” They were not so successful with morose old gentleman, who could see no beauty in their “darlint collars;” and they quite failed in an attempt, evidently persisted in for their own amusement, to dispose some beautiful little babies’-caps, to a waspish old girl of sixty-five! 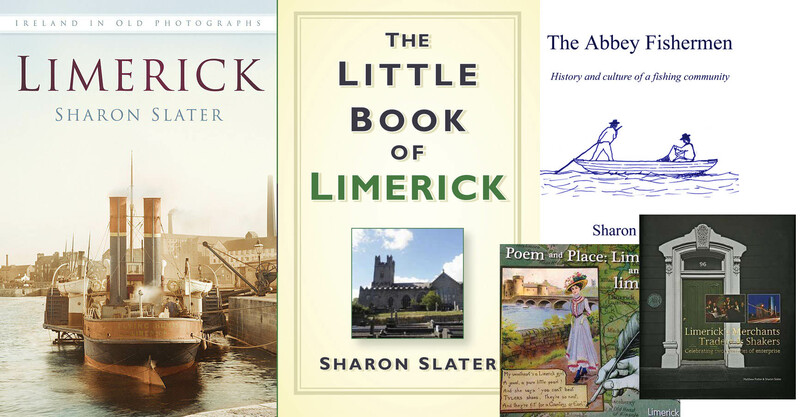 Limerick is divided into three parts, the Irish town, the English town, and Newtown Perry (so called after a Mr. Sexton Perry, who commenced it); and these are connected by bridges, of which the old Thomond, hard by King John’s Castle, and new Wellesley, said to have cost 85,000l, are interesting. The eccentricities of the workmen must have added materially to the costliness of the latter structure, inasmuch as they seem to have been Odd Fellows as well as very Free Masons, who, instead of cementing stones and friendships, only turned the former into stumbling blocks for the latter, by throwing them at each other’s heads. Every day an animated faction-fight, between the boys of Clare and the boys of Limerick, was got up (instead of the bridge), until at length it was necessary to bring out an armed force, to keep order on this Pons Asinorum. The main street of Newtown Perry, in which is Cruise’s Hotel, is a long and handsome one; and what’s more, you may buy some good cigars in it, a rare refreshment in Ireland. We went to see the Cathedral (partly out of compliment to the memory of good Bishop Jebb); but its iron gates were scrupulously locked. Perhaps, had they been open, we should not have ventured within, for the building had a grim uninviting look, and seemed as though it despised us thoroughly for daring to come when it wasn’t service-time. I should not have been at all surprised, if “a variety of humbugs in cocked-hats” had sallied forth to disperse us. One of the lace-girls, for they had followed us, with reduced prices and a fresh supply of their pretty work, told us, as we turned from the gate, that “during the grate sage o’Limerick there was a might big gun an the top of that church, that kept firing away, day and night.” Whereupon Frank said, that the interesting fact was highly reditable to the Dean and Chapter, who generally deputed and hard work to one of the minor cannons. In which of the sieges did the great gun thunder? Was it that of 1651, when Ireton (whose character one never can identify with that beautiful portrait engraved by Houbraken, for how could such a noble presence belong to a men “melancholick annd reserved,” and so wanting in personal courage, as to allow Mr. Holles to pull him by the nose) died before the walls from the plague? Or did it some forty years later send forth its sulphurous and tormenting flames, against “bould Giniral Ginkil,” and help to expedite that Famous Treaty of Limerick, honourable alike to all? We did not see nor hear anything of the great Pig-Factory, whereat one million porkers are said to be annually slain. A stern Hebrew, of truculent taste, might possibly venture to settle in the vicinity; but the music must be too high by several octaves for Christians of the ordinary stamp.